An ongoing storytelling project focusing on region and culture specific folklore from around the world, complete with immersive narrative, lush music...and a dark edge. Each series of the podcast focuses on a specific region of the world. Each episode consists of a brief introduction and usually four stories, carefully researched and then retold, remaining true to the original tales while also adding detail for a modern audience. All of this with ambient music for an immersive AND educational experience! Sign up with your email address for updates on new episodes and more! Thank you! You'll receive emails when a new episode of Mythos is available on iTunes or Pocketcaster. The sense of mystery and ancientness and spiritual ‘otherness’ evoked by prehistoric sites - my interest in this was sparked by two sources…. The baying of hounds, blacker than night, on the desolate wilds of Dartmoor; the stag-horned hunter who serves as an omen of national tragedy; suffering in the notorious Newgate prison manifested in the form of a giant black dog...well, these are potent images, certainly. No storyteller could resist. From the castle haunts of witch hares and rabbit haunted groves in England to fey goat maidens in Scotland and horse-mounted portents of death in Ireland, we will explore stories from that parallel dimension, the land of dead. Variously a mythical wise woman, a witch, a forest spirit or a leader of others in the spirit realm, Baba Yaga’s legacy of lore comes from mixed cultural groups within Eastern Europe and as such a fantastic and horrifying collection of motifs have assembled around the character. Lady death mowing down a victim with her scythe. A demon of the harvest fields in the shape of a mourning widow. Is it any wonder that folklore symbolically conflates death and the harvest in such potent images when the harvest was the very heart and pulse of the agricultural communities of the ‘folk’? In lore across the Slavic world, from the northern Slavs of Poland and Russia to their southern kin in Croatia and Slovenia, there are the so-called ‘unclean’ spirits of forest and field, home and bathhouse. And the more domestic of these unclean spirits - those of the home and bathhouse - is our focus in this episode. Now, we will meet these mysterious beings, in whom mingles the earthly and angelic, in whom dwell the deep powers of ancestral longing, order and homeliness. From the glacier-covered Russian island of Novaya Zemlya to the coniferous forests and fecund lake basins of Poland; from the great heights of the Ukrainian Carpathians to the dark waters of the Slovakian Danube, you will hear tales of water-bound beings who are dangerous to mere frail humans. From vampire dolls to nuclear freaks, this episode will look at urban legends told fairly widely in the Soviet Union from the 1960s to the 1990s. 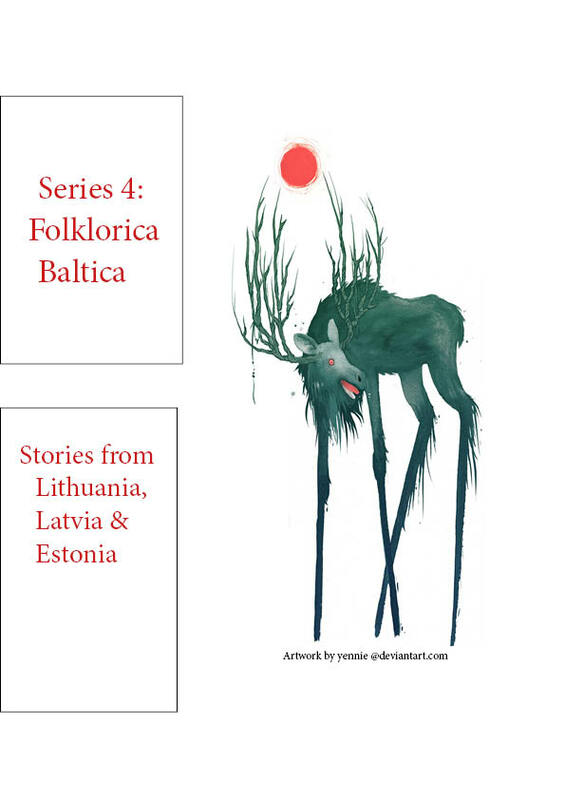 Welcome to Series 3: Folklorica Nordica. We will journey into subterranean and spiritual realms - through the folklore of the Nordic world. We will encounter the shamans, the subterranean beings, the wise-folk and healers, and the trolls and giants of Norway, Sweden, Denmark, Iceland, the Faroe Islands and Finland. In these northern lands, we will encounter a fascinating body of tales retold to evoke not only the original magic of the stories but also the beautiful and mysterious regions they come from. In folklore across the Nordic world, the human soul or ‘hug’ is a force to be reckoned with and is intimately connected with the body. Indeed, if a person were to be somehow separated from their hug, perhaps through magic, they were said to have been ‘hugstjalet’ or ‘hug-stolen - a folk explanation for people who showed abnormal behaviour and psychological disorders. The soul, or ‘hug’, is a source of power and manipulation of the hug is the source of all magic. The hug could free itself of the body for various periods of time and could live a life outside the body. Dark northern forests of ambiguous shadow and sinister presence. Ancient churchyards with secrets beneath searching feet. Inhuman beings of terrifying power made even more powerful during the spiritually potent winter season….these are all elements of the Swedish tradition of Arsgang, or the Year Walk, in which an individual completes a kind of divination journey through night-shrouded woodland. Through forest, field and churchyard the year walker journeys, hoping to gain insight into the future, to know their own fate as well as the fate of their village, to have some knowledge of those issues of life and death: war, crop-destroying weather or fire, disease, significant deaths. In this special guest episode, London storyteller Sarah Liisa Wilkinson tells stories from the Kalevala, a 19th-century work of epic poetry compiled by Elias Lönnrot from Karelian and Finnish oral folklore and mythology. From frozen wilderness to the very land of the dead, hear two tales of brave women who venture into hostile territory. Called jätte (yett-uh) in Swedish, troll or jutul (yoo-tool) in Norwegian, trolls and giants are prominent in fables and in etiological legends explaining the origin of many huge rock formations, lakes and the so-called giants potholes. The Norwegian word ‘jutul’ stems from the Old Norse Jotunn, which denotes a race of giants in opposition to man and gods. Massive, self-centred and able to gouge and shape hardy landscapes, they are not without a powerful nemesis: the sun. From the pine-laden mountains and prosperous farms of the Vågå region in Norway to imperial Copenhagen, from the jagged-peaks and moss-laden cliffs of Iceland’s West-fjords to the immense vertical sea cliffs of the Faroe Islands, we will hear tales of earth-sculpting colossal beings. The hulder-folk, sometimes referred to as the hidden-folk or subterraneans, are preternatural beings that populate wild areas and are given to enticement and abduction. While thought to live beneath the ground, they are often sighted, heard and experienced in forests, mountains and moors.